Fault: A short backswing that costs you distance. Fix: As we get older we may not be as flexible as we used to be, meaning we don't turn as well or hit the ball as far. One simple way to increase your shoulder turn and create more power is to turn your front foot in at address, so that it is pointing straight ahead. You will find it much easier to make a full shoulder turn on the way back and create lots more power. It will also stop the hips from spinning out too early in the downswing to improve your accuracy. Squaring your front foot frees your hip turn, helping the extra coil that means increased yardage. Another distance-builder is increasing your speed. A quick and effective way to do it is turning a club upside-down and swinging as fast as you can – 10 times with each arm. You will instantly feel your arms and body move much faster through the ball. 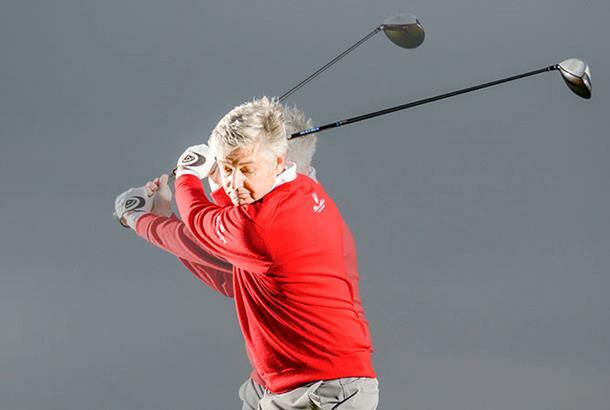 Squaring your front foot from a flared position helps you complete a longer backswing and gives you more swing force.